54 members of Knesset have signed a petition in favor of Zionist settlers reclaiming houses and lands in the former Jewish quarter of Hebron, purchased by Jews in past generations, which were abandoned after the violence of 1929. The petition also supports settlers' rights to purchase new buildings, for example the recently purchased "Beit HaShalom" [Peace House] between Hebron and Kiryat Arba. The petition was written as a result of the case currently before the Israeli Supreme Court, in which the Peace Now organization demands that a family be evicted from its home in land that, under Jordanian rule, became an Arab market. Peace Now also demands that a room added on to a Jewish house in the same area be razed. From the year 1540 until 1929, Jews lived on a large plot of land in Hebron, commonly known as the Jewish Quarter. It was purchased by Rabbi Malchiel Ashkenazi, a refugee from the Spanish expulsion in 1492. Following the 1929 uprising and the exile of the community's Jewish population, this property, including houses and synagogues, was abandoned and left uninhabited. On part of the land, the Jordanians built an outdoor food market, which continued to operate even after the Zionists conquered the city during the Six Day War in 1967. In 1995, the Israeli army decided to clear out the Arab store-owners in the marketplace. "The sole purpose for the closing," wrote settler leader David Wilder at the time, "was to provide security for the Jews in Hebron, [which had been] jeopardized by the hundreds of Arabs who frequented the market every day." In 2001, Zionist settlers decided to reclaim to the land of the marketplace, and began renovating the stores, turning them into inhabitable apartments and moving families in. Within a short time, 11 families were living there. When Ehud Olmert took office as Acting Prime Minister in 2006, he ordered a forcible eviction of the settlers. At the last moment, however, an agreement was reached whereby the Jews would leave on their own and would return legally within two months. This agreement was never honored, however, and within a few months, two families had secretly returned. 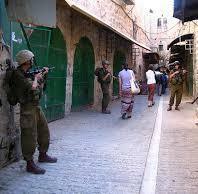 In early August of 2007, Israeli security forces forcibly evicted the two families, as well as dozens of supporters. The signatories of the current petition include all MKs of the Likud and National Union parties, and all the United Torah Judaism MKs, except for one who is abroad. Among the coalition parties - Ministers and Deputy Ministers are not permitted to sign petitions - all the eligible MKs of Shas and Gil (Pensioners) signed, 7 of 9 non-ministerial Yisrael Beiteinu MKs, and 8 of Kadima's 17 eligible MKs. This dressing up of Zionist militancy in the moralistic garb of reclaiming land owned by Jews 80 years ago can only strengthen the Palestinian refugees in making a similar argument, that Palestinians should be allowed to return to lands that they abandoned out of fear or were expelled from during the war of 1948. When the United Nations recommended in November 1947 to partition the country between a Jewish and an Arab State, less than 7% of the land belonged to Jews. With the founding of the Zionist state, the new state transferred to the Jewish National Fund millions of dunams of land expropriated from Arabs - the refugees who were not allowed to return ("absentees" in legal language), those who had remained in the country but were absent on a given day from their villages ("present absentees"), as well as Arabs who became citizens of the State of Israel. The Jewish quarter of Hebron is tiny in area compared to all this land.